If you like this free game, try Chronicles of Albian 2: The Wizbury School of Magic. Return to the undersea world of Lagoona! Poseidon Park is in trouble. The Mayor has shut it down until repairs are made and Leona is desperate to save the park. Join a quirky cast of characters as you set out on another Hidden Object journey in Lagoona! 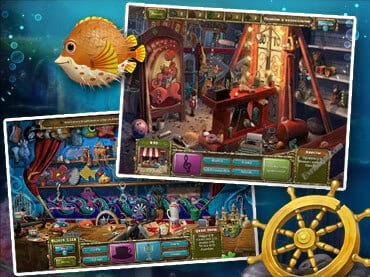 Find and sell valuable hidden objects, and use this money to restore this source of fun in the beautiful undersea world of Lagoona. Choose between over 150 upgrades, and make sure you complete all challenging puzzles. Play Tales of Lagoona 2 - Peril at Poseidon Park Deluxe now! If you have questions about Tales of Lagoona 2: Peril at Poseidon Park game, please contact us using this form.